Hongkeng Tulou, located in Hukeng town, is the most concentrated of all earthen house clusters. 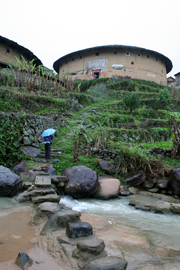 There are about 100 tulou of various sizes in the long village lying along both banks of a river. Some of the house designs are unique, including the Zhenchenglou, Fuyulu ("Five-Phoenix House"), Kuijulou, and Rushenglou. 1. Hongkeng Tulou, located in Hukeng town, is the most concentrated of all earthen house clusters. Some of the house designs are unique, including the Zhenchenglou, Fuyulu (Five-Phoenix House) Kuijulou, and Rushenglou. 2. Chengqilou, the King of Tulou is The biggest tulou in Yongding County following a very classical design with a large central hall. 3. Tianluokeng Tulou, located in Shangban Village, Shuyang Town, composed primarily of four round and one rectangular earthen houses. Most of Fujian Earth Buildings are scattered around the mountain area between Yongding County and Nanjing County. The best way to visit the area is to hire a local vehicle. There is long-distance bus from Xiamen to Yongding or Hongkeng and it takes about 2 and 3 hours respectively. You can also take train from Guangzhou or Xiamen to Yongding. Both train leave in late afternoon and arrive in Yongding at midnight. We provide car hire with English-speaking guide to the area. Please contact us for detail.